The original post I wrote got eaten somehow by the Android app for WordPress, phone rebooted due to low battery during the upload and both the app and the website seem to lose all but the original title – oops! 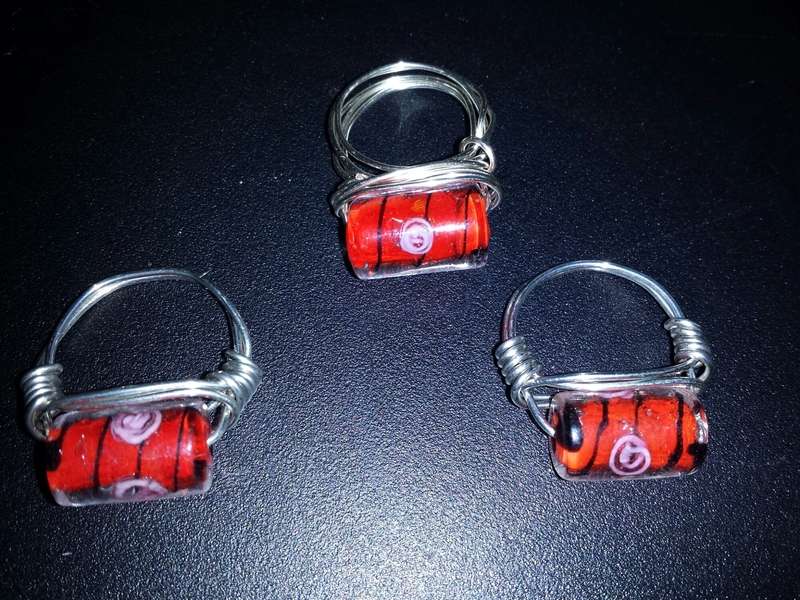 Red flower glass beads used on rings. 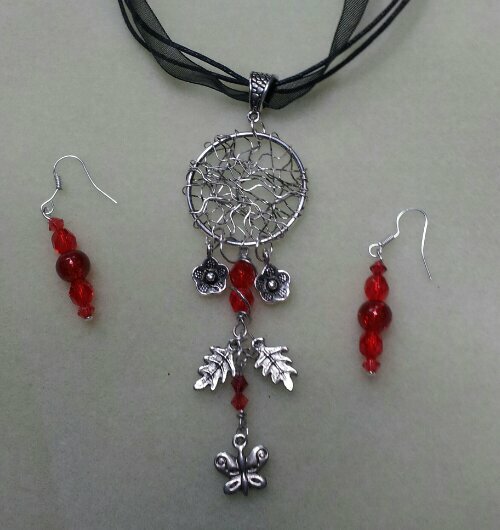 Anyway, I wrote in that post that I’d had the frustration of trying to design a pair of earrings, a necklace and maybe a bracelet to complement a new dress I have. The red flower glass beads I bought recently – and used recently for some rings – are perfect for it, but finding the right combination of spacer beads and enough of them proved a pain! my stash of beads, findings and so on is a bit disorganised to say the least. Red flower glass bead ring and first design idea. Ended up a bit longer than I first intended, but I think they work nicely, though still not entirely sure about the dangly bits on the ends, I might cut those and the loop off and leave it with a knot at the bottom instead. That gave me the final design and it just remained to decide the method of wearing it (ie ribbon or chain etc). I couldn’t find ribbon I wanted in my stash, so chain it was. Enough work for today I think. My back hurts now, but I’m happy with the outcome. Cuff-links will have to wait till tomorrow if I get chance. It was Natalie ‘ s birthday recently, so as usual I decided to make jewellery as a gift for her. 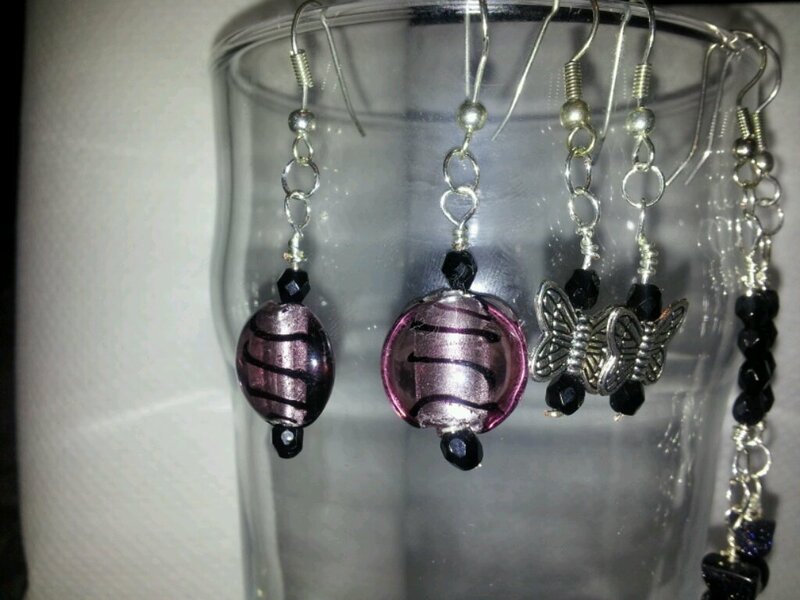 First up were a couple of pairs of earrings for her. 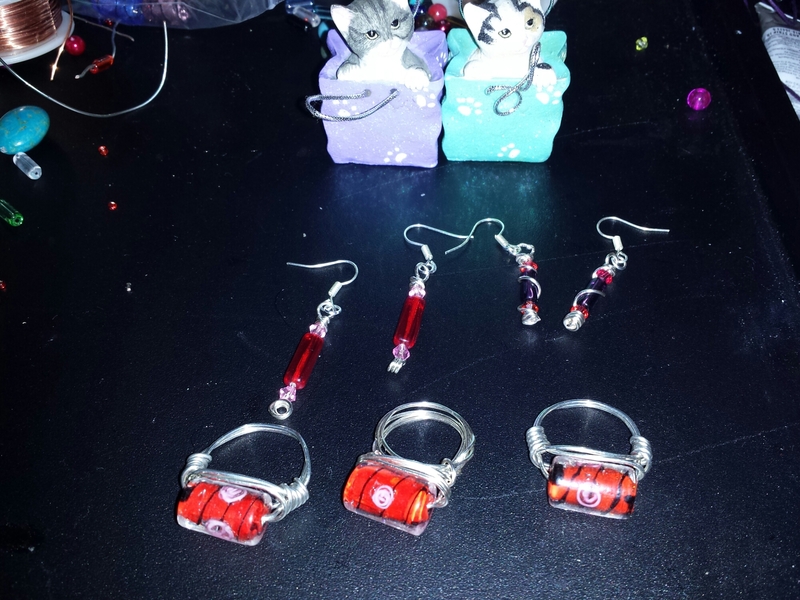 The pair on the left were made from some beads I used before Christmas for earrings, originally as a possible design for a gift from her to her nan to match a necklace (in the end I ordered some red discs instead, which worked better, nat liked them herself though so I gave her them. Turned out her mum rather liked those and asked for some (not pictured, her mum’s friend also wanted a pair too ). I decided to make them a little different for this pair though. I like items to be unique! 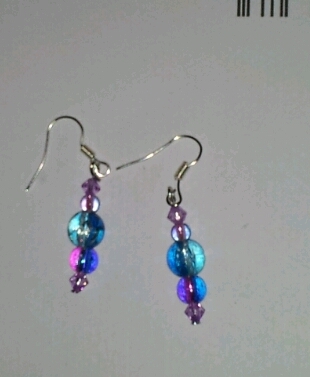 Next I made a pair with some new beads I’d gotten. I ended up ordering these as I couldn’t for the life of me remember where I’d bought those others I’d previously used. They were not the same at all as it turned out, but I rather liked them anyway. The colours are not quite as in the picture though, they’re more a reddish browny colour, hence red beads with them. Next I decided to make something different for another gift for Nat. I found a tutorial on pinterest that inspired the rings made below. I decided to make one for myself and one for Nat. I rather like the beads I found and think they work well in this way. My first attempt I wasn’t too pleased by (middle top ,and ot ended up smaller than intended! Still if gave me the practice to get the next two better. 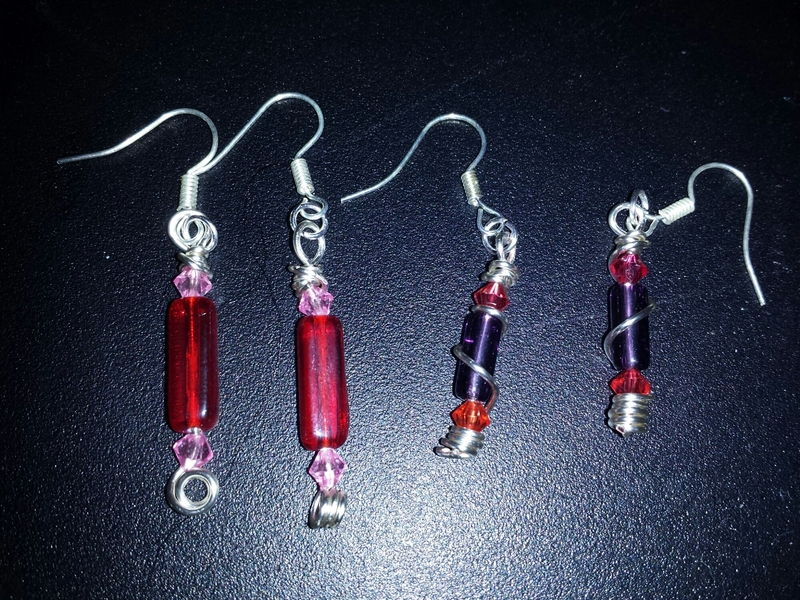 I used a different gauge wire with the next two. Which worked better. Originally I gave the ring on the right to nat, but she swapped it for the one on the left as it wouldn’t fit her fingers (wanting it to be a surprise gift I didn’t know her ring size ). I might make some more as I’ve some different colours that’d work like this I think. I need to make myself another I think too as the one on the left only fits my little fingers, not a finger I usually wear rings on. Finally a picture of all the items together. Also visible is two of the cats I found in a charity shop for 99p. 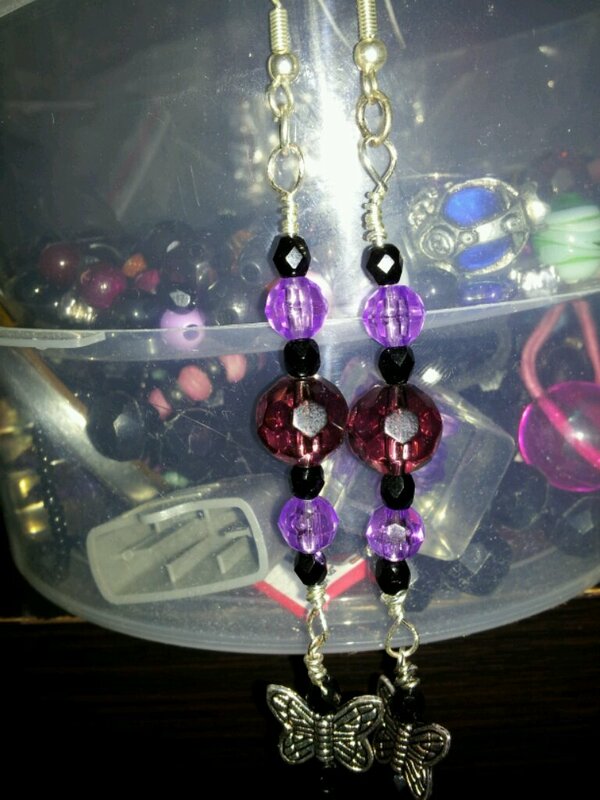 I kept the purple one,and gave nat the other one pictured (there were 3, but I gave the 3rd to Richard for his mum ). Hopefully should have more soon as a lady at my slimming world group liked the ring and asked for one in green. Recently it was my boyfriend Richard’s mother’s birthday. It was the first time we’d met as well so for the occasion I decided to make her some jewellery as a gift. I do need to make up some magnetic clasps though for her. 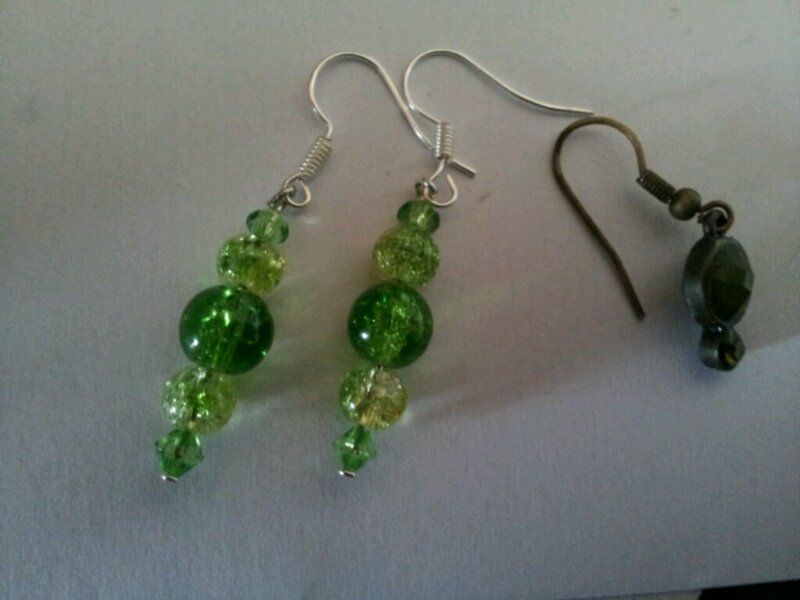 Recently a friends mum asked if I could make some earrings to match ones she’d lost one of. She loved them. Very simple, but they go with a number of necklaces she has. On the right can just be seen the original earring, which had set stones in brass, lacking brass I used silverplated instead. Last week was my best friends birthday. 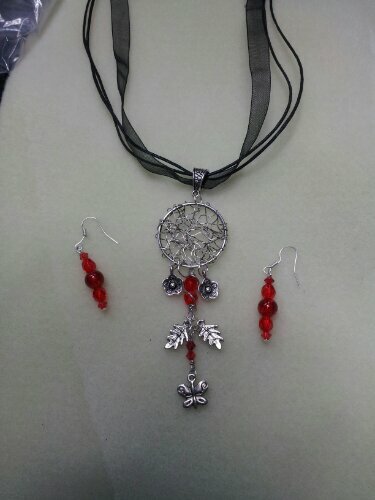 So as a gift I made her th necklace and earrings below. There are a few specifics about it that I chose to complement my friends tastes. 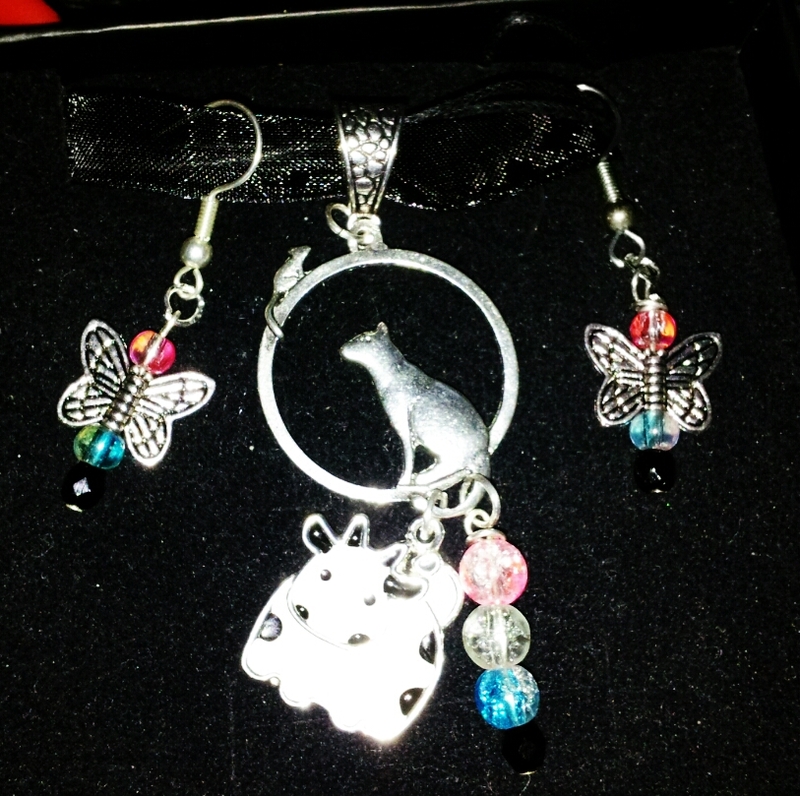 She loves cats and cows, hence the focal and cow charm. The colours have special significance to her as well. 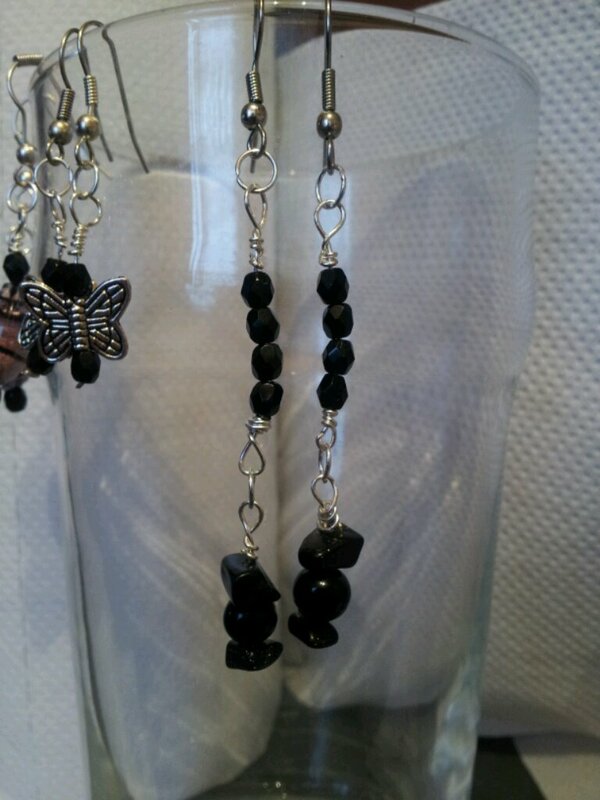 And finally the butterflies were because she liked the butterfly earrings I’d made for myself previously. I’m rather pleased with them 🙂 and was very happy they were well received. Just a few of the first items I tried making. The last pair were made for a Banquet at the 2012 Discworld Convention, which was great fun. Matched the goth choker I had decided to wear nicely! It taught me a few techniques in doing these, simple wire item type stuff. 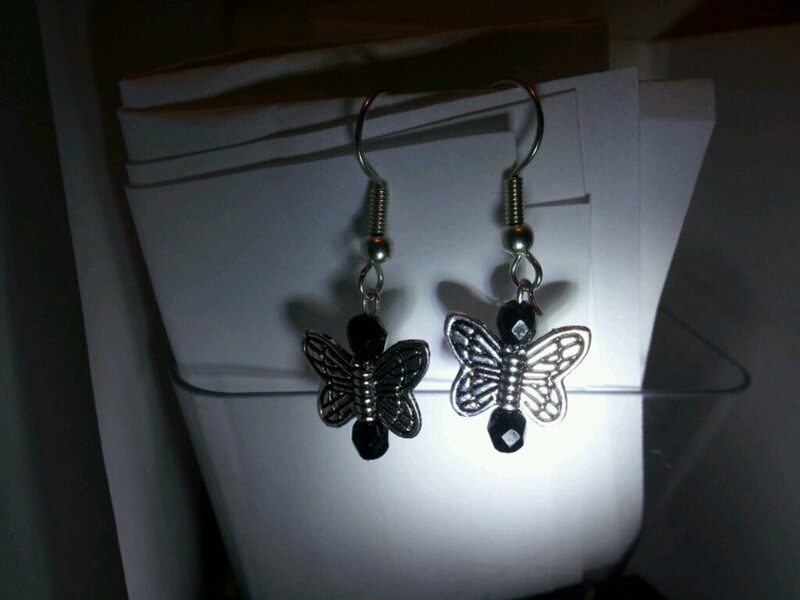 I also made a little pair of butterfly earrings similar to those above as a small gift for a friend.